you must know that this is not caused by incorrect driver, as it is a normal problem in windows 10, windows 7, windows 8 etc. First of all, you need to make sure you are running the newest windows service pack. if you use windows 7, just update to sp2 etc, if you use windows 8, just update to 8.1 etc. OK, now let us go to the solution quickly. We find there are many free driver software in the world, like driver the life, device doctor, slimdrivers, driver booster etc, at here, we highly recommend you use driver booster, because it is totaly free and most efficiency than other driver software. you can download it here. 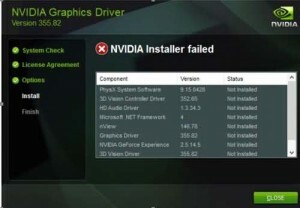 You need to nvidia drivers download site first, this is the link: http://www.nvidia.com/Download/index.aspx, then choose your nvidia product type, product series, product model name, your computer’s systerm, and the language, then click search button, download the correct nvidia drivers for your computer, then install it. it will let you spend much time on this, so the easiest way are Method 1.
if you find this folder did not exist, then you did not run the installer befor, so just create this foder then restart your computer when it is done. Solution 4: Reinstall the Windows systerm for your computer. The final solution you can try is to reinstall Windows. 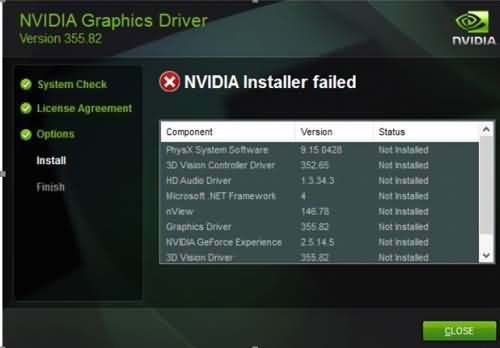 Hope all solutions here can help you resolve the NVIDIA Installer failed problem. Summary: Try the method above until you fix NVIDIA Installer failed problem. According to the feedbacks from the users, The solution 1 works the best. If you have any problem, contact us. ← How to fix wireless & network drivers problems?